African American students are 4 times more likely to be placed in special education than are their European American peers. 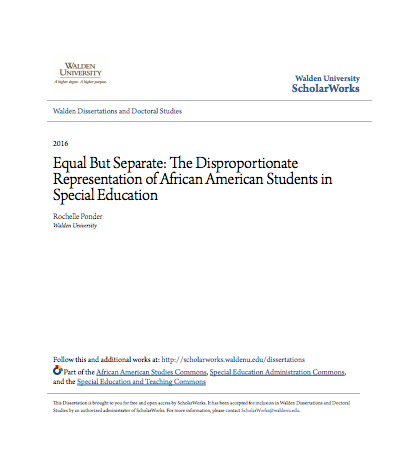 The purpose of the study was to determine whether the application of professional development (PD) would change teachers’ attitudes toward African American students who were achieving below grade level. Teachers in one school district received PD; the teachers in a separate school district did not receive PD. Bandura’s social learning theory and Kunjufu’s Afrocentric curriculum served as the theoretical framework. A preexperimental design and a static group comparison were used. The sample comprised 83 teachers, with 52 (63%) from the school district that received PD and 31 (37%) from the other school district. An amended version of the 21-item Teacher Attitude Survey, which measures teachers’ attitudes toward low-achieving students, PD, and special education, was given to both groups after the treatment was applied to the first school district. Survey results were used to test 4 hypotheses: (a) There were no differences in teachers’ attitudes toward achievement by district, (b) the amount of training on cultural sensitivity did not relate to teachers’ attitudes toward achievement, (c) there were no differences in the average number of students referred to special education for each teacher by district, and (d) the amount of training on cultural sensitivity did not relate to the number of students referred to special education. Spearman’s rho, t tests, and Mann-Whitney U test were applied. All but Null Hypothesis 3 failed to be rejected. Implications for positive social change begin with educating teachers about the effect of attitudes on the academic futures of African American students. Engagement in PD will begin the work of ensuring equity for all students in public education in the United States.